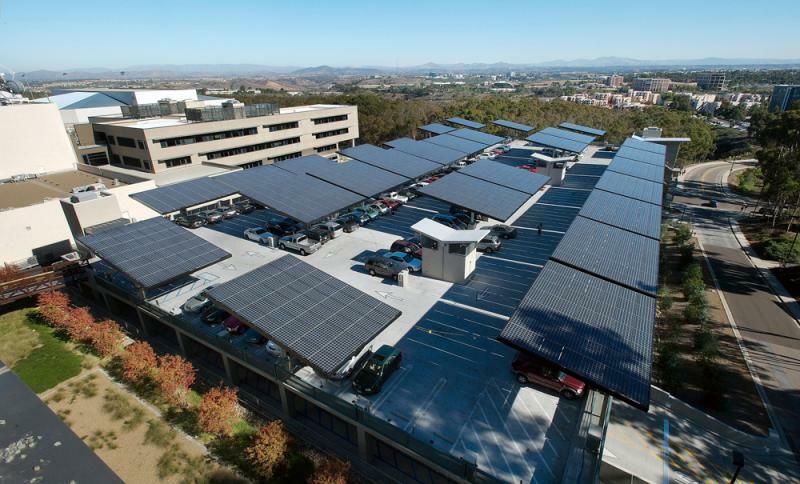 The UCSD microgrid project supplies electricity, heating, and cooling for 450 hectare campus with a daily population of 45,000. It consists of two 13.5 MW gas turbines, one 3 MW steam turbine, and a 1.2 MW solar-cell installation that together supply 85% of campus electricity needs, 95% of its heating, and 95% of its cooling. The turbines produce 75% fewer emissions of criteria pollutants than a conventional gas power plant. For HVAC, it uses a 140,674 kW/hour, 14,385 m3 capacity thermal energy storage bank, plus three chillers driven by steam turbines and five chillers driven by electricity. A 2.8 MW molten carbonate fuel cell is running on waste methane, which is sponsored by California’s self-generation incentive program funds and takes advantage of a 30% federal investment tax credit. The campus is connected to SDG&E by a single 69 kV substation. IT uses a “straight SCADA system” for the building systems and energy supply to ensure their communication with each other. UCSD is installing a new, high-end master controller-Paladin, which will control all generation, storage, and loads with hourly computing to optimize operating conditions. It can receive as many as 260,000 data inputs/second. To support Paladin, UCSD will use VPower software to process market-price signals, weather forecasts, and the availability of resources. About 200 power meters on the main lines and at buildings’ main circuit breakers, track use minute-by-minute. The UCSD campus has been installed with power meters throughout the main electrical lines and at the buildings’ main circuit breakers. Lastly, DOE just gave USCD a grant to model the effects on the local distribution system from the ramping up and down of the solar PV system’s output.